The Keurig K45 Elite is a single cup coffee brewer that provides a balance of simplicity, versatility and convenience. With a solid plastic housing, the K45 is stylish, durable and easy to maintain. Three brewing size options allow for brewing versatility, while dishwasher safe parts make this unit a breeze to care for. Perfect for at work or at home, the K45 offers the best from the inventors of single cup coffee makers. Keurig has long been one of the favorite brand in providing the world with some of the best Single Serve Coffee Makers which are very easy to use and maintain too. There is no worry about buying one from this brand as it has a proven record of providing the world with the most successful units. Recently, the Keurig K45 has been discontinued by the brand and is replaced by an upgraded version called Keurig K55. There is not much a major difference as both the models support the older K-cups as well as the newer 2.0 version K-cups. The K55 has a slight change in dimensions and weight, that’s all. The new brewer K55 again brews over 500 different K-Cup pod varieties from 75 brands including Green Mountain Coffee, Starbucks, Lipton, and more which are also supported with the Keurig K45 Elite. So basically, Keurig time to time updates and improves it’s brewing systems with newer versions which is the same with the K45. So buying the updated version, K55 Elite is preferred because there might be chances of not getting all spare parts of the discontinued model over time. Below is the image of K55 and you won’t even notice any difference. Although, the brewer reviewed here is K45, but the K55 holds the same features and specifications as it’s sibling. Easy to remove 48 oz. capacity water reservoir. Automatic power off energy saving feature. Fast heat technology, providing hot water in less than a minute. Simple, one touch button interface. Easy to remove drip tray. Brew size versatility: 6, 8, and 10 oz cup options. Hot water for tea, hot chocolate or instant soup. 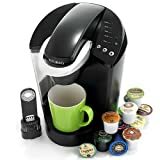 Includes 2 charcoal water filters, one water filter handle and an introductory 4 piece K-Cup variety pack. Below are few of the features that make this unit exceptional from other and can be your deciding factors for selection. The Keurig K45 Elite comes equipped with a 48 oz water reservoir. This large capacity reservoir allows you to brew multiple beverages without having to worry about stopping for water. Make up to six 8 oz drinks between each water refill. Additionally, the water reservoir is easily removable, making water filling and cleaning hassle free. Keurig knows how hectic your days can be. An automatic power off feature will turn the machine off after a period of non-activity. Now you won’t have to worry about whether or not you remembered to turn your home coffee machine off ever again! As well as being a safety benefit, the auto-off feature also ensures that the machine is energy efficient. The fast heat technology of the Keurig K45 Elite means that the machine is ready to brew virtually instantly. Begin making your beverage in as little as 1 minute from turning the unit on. A built in microprocessor ensures that the water is kept consistently hot when on. This allows for instant brewing with a single press of a button and next to no wait time. The K 45’s drip tray is easy to remove. This allows for easy cleanup, which requires little more than a quick rinse. The drip tray is also dishwasher safe for those times when you want a more sterile clean. Removing the drip tray also allows you to brew directly into taller mugs, adding yet more convenience and versatility. One touch controls allow you to choose one of three different brewing sizes. Six, 8 and 10 oz brewing options offer added versatility of both drink size and drink strength. The K45 provides pure, piping hot water for beverages besides coffee. Now you can make tea, hot chocolate or even instant soup with the same convenience as K-Cup coffee. The all plastic construction of the K45 Elite provides a machine that is both durable and light weight. With a clean, crisp look, the K45 adds a touch of style to any modern or contemporary kitchen. The all plastic design also allows for easy cleaning, requiring nothing more than a wipe down with a damp cloth. Keurig wants you to be able to enjoy your machine immediately. For that reason, the K 45 comes with a 4 piece variety pack of K-Cups. Two charcoal filters and one water filter handle are also included, making maintenance worry free from the start. The Keurig K45 Elite is backed by a full 12 month manufacturer warranty. This warranty ensures the quality of the parts and construction used in creating your single serve brewing system. The K45 Elite has been well received, scoring 4.3 stars out of 5 stars from over 4500 customer reviews. The Keurig K45 Elite comes complete with a starter pack of K-Cups, water filters and a water filter handle. This means you can begin to enjoy the K 45 as soon as you take it out of the box. Simply plug in, add water to the 48 oz water reservoir, choose your cup size, and brew your first beverage. One touch programming makes your brewing experience as easy as it is enjoyable. If you are in need to buy cheap K-Cups, visit our article about How to Buy Cheap K Cups. One more thing about the brewers is the ongoing maintenance, that is cleaning up. Keurig’s are used very frequently due to being fast single serve coffee makers. And so, the ongoing cleaning is required with these. TheKitchn has depicted the same in a great way which is surely going to help : How to Clean a Keurig. The Keurig K45 Elite is compatible with any brand of coffee pod. This allows for an even broader coffee drinking experience. The clear plastic of the water reservoir makes it easy to see when the water level is low. An indicator light will warn you when the water reservoir is low on water. The water level sensor in the reservoir will prevent brewing when the water level is too low. This helps to ensure top quality coffee brewing each and every time. The charcoal water filters ensure the quality of the water used, guaranteeing the best taste anytime, anywhere. Additionally, the charcoal filter replacements are cheap and easy to find. The drip tray is easy to remove, making for easy cleanup. This also allows for enough room to brew directly into a travel mug. Some customers have complained about how much time it takes the K 45 to brew a cup of coffee. Concerns have been raised over how fast a cup of coffee loses temperature. The K45 Elite has some reports of being noisier than other machines when brewing. Some customers have been disappointed by the limited number of features offered in the K 45 Elite. The Keurig K45 Elite is a great choice for a single serve coffee brewing system. A high customer rating proves the K45 delivers on Keurig’s promise of quality coffee served with versatility and convenience. This model is perfect for any coffee enthusiast, whether at work or in the comfort of their own home.